A couple of things you’re going to need to make this cake… Patience, patience and more patience. You bake a layer, then you refrigerate it, you bake another layer and then you freeze it and finally you bake the last layer and then you place it back in the refrigerator so it can chill before enjoying a slice. But don’t worry, the first bite is worth the time and patience! 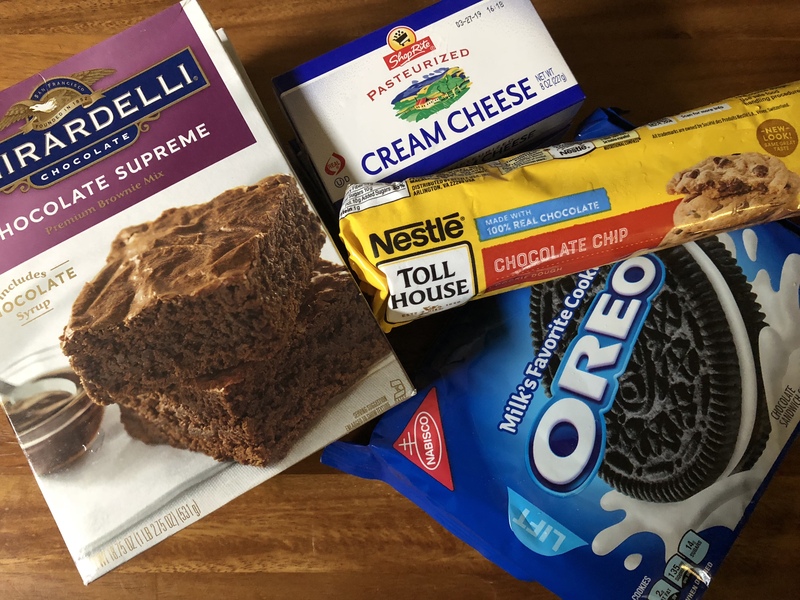 To make things a little easy for myself I followed the directions and used store bought chocolate chip cookie dough and boxed brownie mix. I began by lining a 10-inch springform pan with 2 pieces of plastic wrap long enough to hang over the sides. 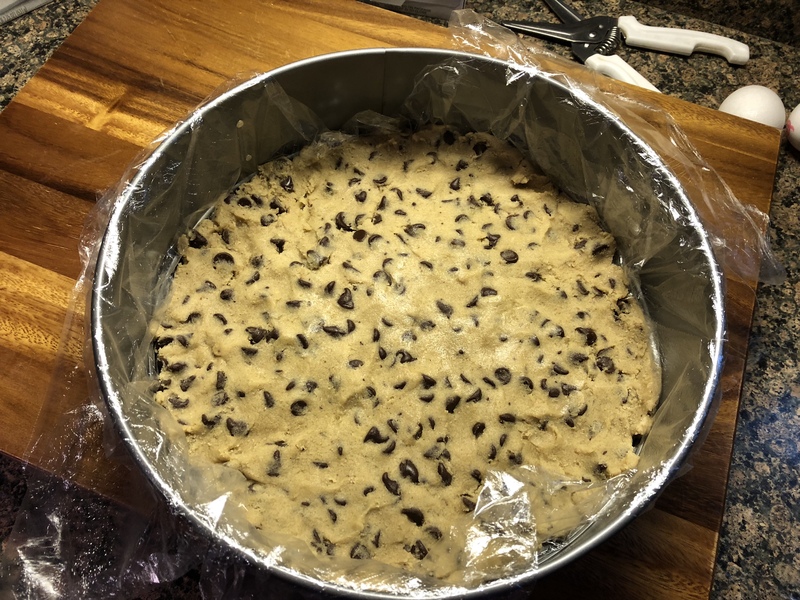 After bringing the chocolate chip cookie dough to room temperature I pressed it into an even layer on the bottom of the pan, folded the plastic wrap over it and then placed it in the freezer. 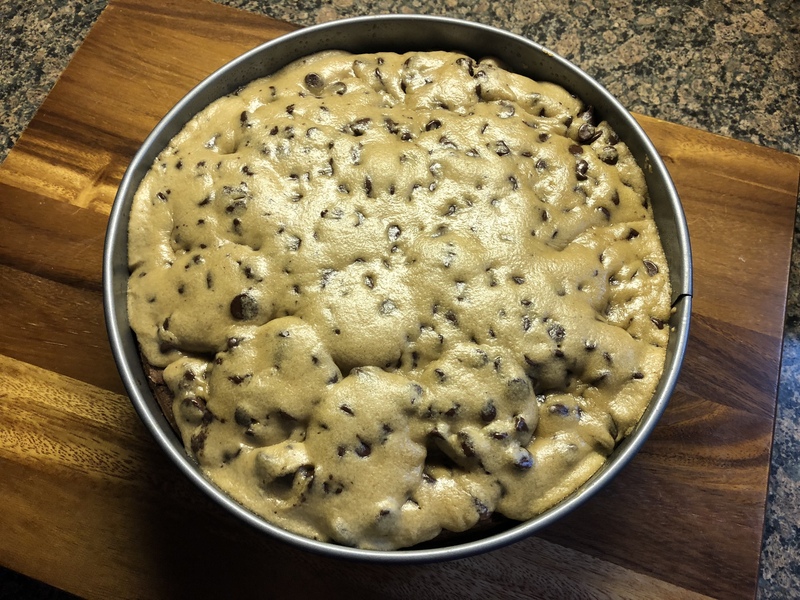 I prepared the brownie mix per the directions on the box and then poured it into the 10-inch springform pan that I sprayed with baking spray after removing the cookie dough. 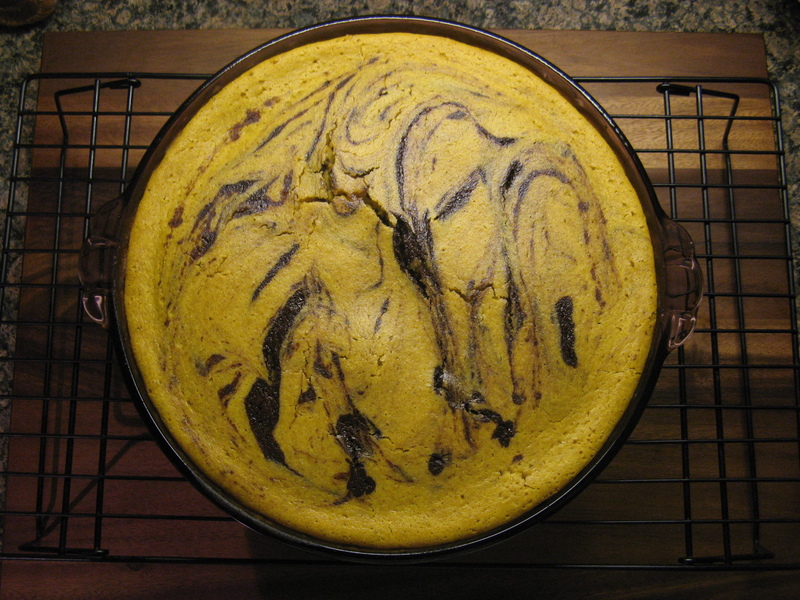 I then sprayed the bottom and sides of an 8-inch round cake pan and pressed it in the center of the brownie mix until the batter reached about halfway up the springform pan. I baked this for about 45 minutes. I removed it from the oven after 35 minutes, per the directions, but felt that the brownie was a little too underdone so I placed it back in the oven for another 10 minutes. While the middle was still a bit undercooked, the outside was cooked. I think that if I make this again I will either cook it for 40 minutes, or reduce the oven temperature to 325 F and bake it for 45 minutes. While the brownie was still warm, I rotated the 8-inch pan into the brownie while carefully pressing it down to push the brownie further up the sides of the springform pan. I then refrigerated it for 30 minutes. I left the 8-inch pan in the brownie while it was in the refrigerator. 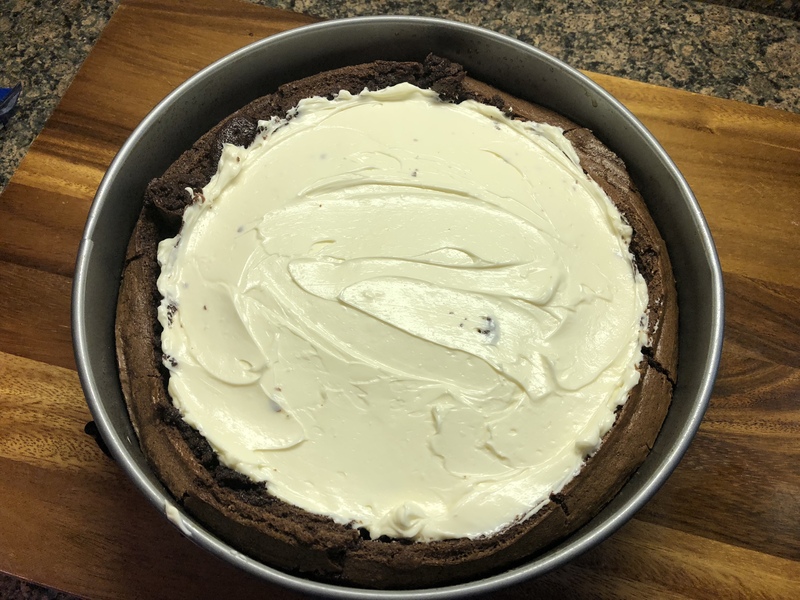 While the brownie was cooling I made the cheesecake batter by mixing together 3 8-ounce blocks of cream cheese with sugar, vanilla extract and an egg until it was smooth and no lumps remained. I set this aside. 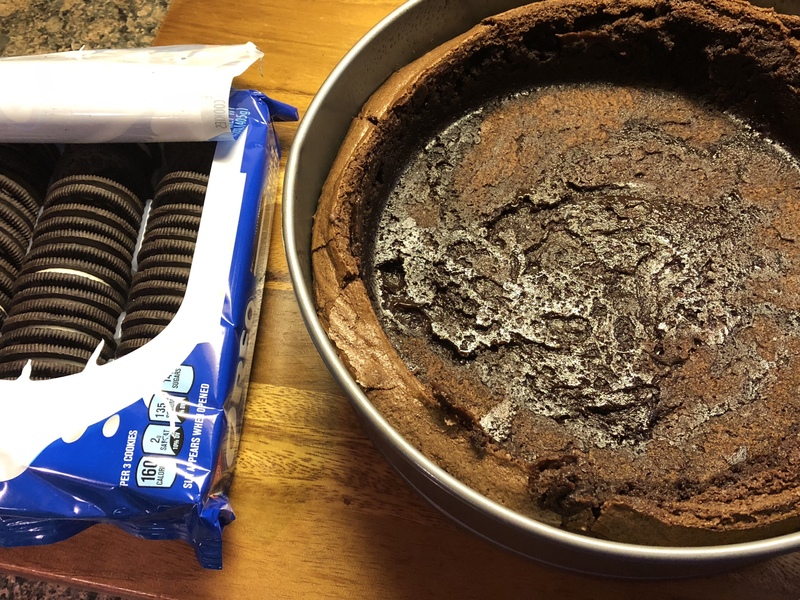 Once the brownie had cooled I removed it from the refrigerator and lined the bottom with Oreos. And then poured the cheesecake mixture over it and baked it in the oven for 40 minutes and then placed it in the freezer, yes, the freezer, for 30 minutes. And finally topped the whole thing with the frozen disc of chocolate chip cookie dough and placed it back in the oven for 20 minutes. After letting it cool for a few minutes I placed it back in the refrigerator so it could chill. Unfortunately, I don’t have a pretty picture of what the layers looked like when it was sliced (I made this for a birthday dinner and really couldn’t stop to take the all-important blog picture once we started slicing it) but I can tell you that it did get RAVE reviews. You might be thinking it would be overly sweet with all of the different layers, but, it actually wasn’t. It was more decadent than anything else and something you don’t need a huge slice of. I won’t lie, I was apprehensive to slice it because I had no clue if all of the layers had cooked properly, especially that brownie layer that seemed undercooked in the beginning, but, I needn’t worry. It probably would have been better if I had left the brownie a bit more undercooked in the beginning. I knew that I didn’t want to overcook it since it was going back in the oven 2 more times, but, I was just worried about putting a half cooked brownie in the refrigerator. I never know what can and cannot grow dangerous bacteria. Line a 10-inch springform pan with 2 pieces of plastic wrap long enough to hang over the sides. 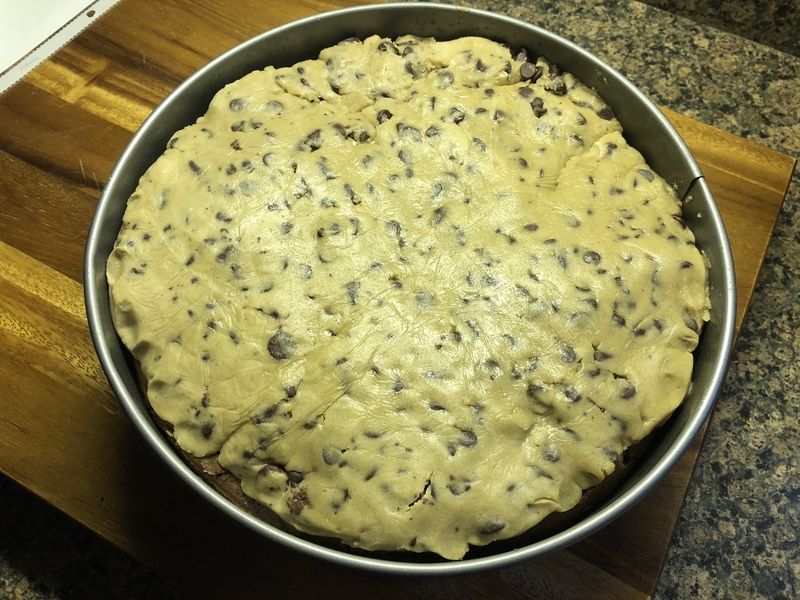 Place the chocolate chip cookie dough into the pan and press it evenly into the bottom of the pan. Wrap it with the plastic wrap and place it in the freezer. 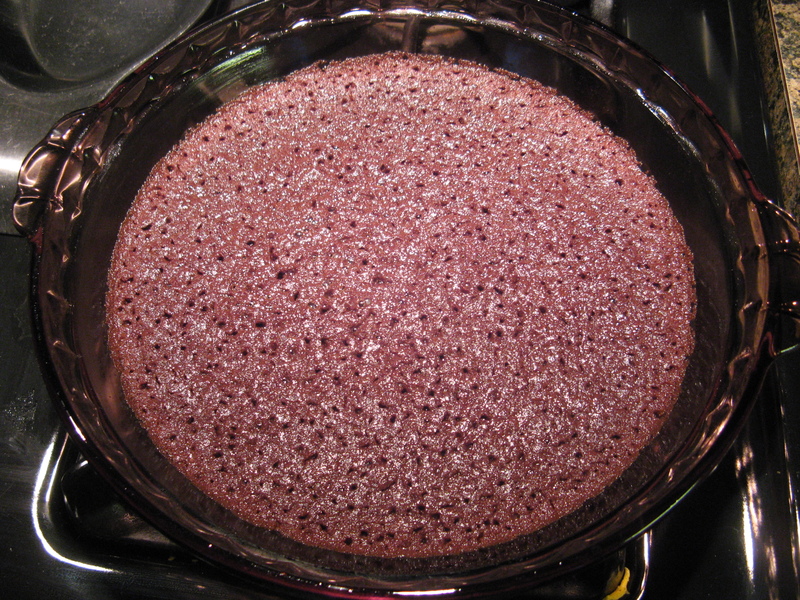 Spray the 10-inch pan with baking spray and pour in the brownie batter. 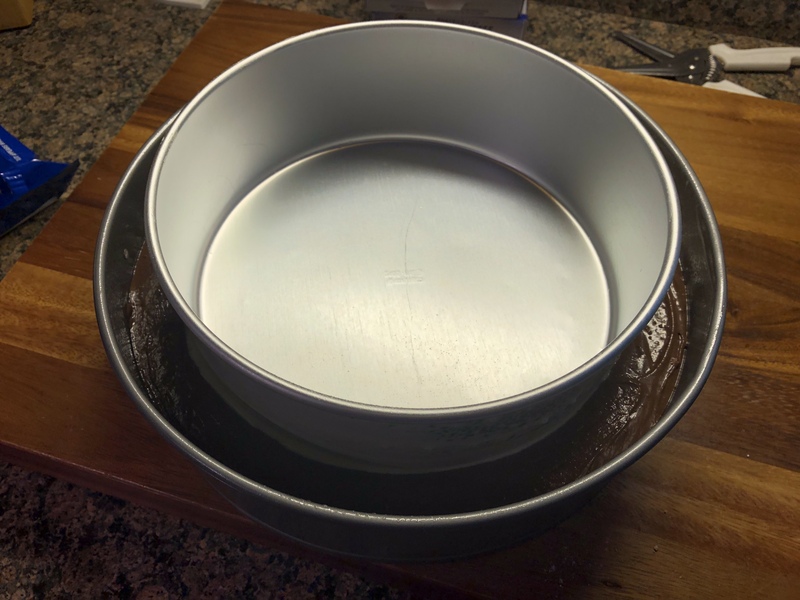 Spray the sides and bottom of a deep (at least 5-inches) 8-inch round cake pan with baking spray and then press it into the brownie batter until the batter reaches halfway up the sides of the 10-inch pan. Bake for 35 – 40 minutes and then let cool for 5 minutes. While rotating the 8-inch pan press it into the brownie so the brownie can come up higher on the sides of the 10-inch pan. Place in the refrigerator for 30 minutes. In a large bowl beat together the cream cheese, sugar, vanilla extract and the egg with a hand mixer on medium speed until it’s smooth. Set aside. 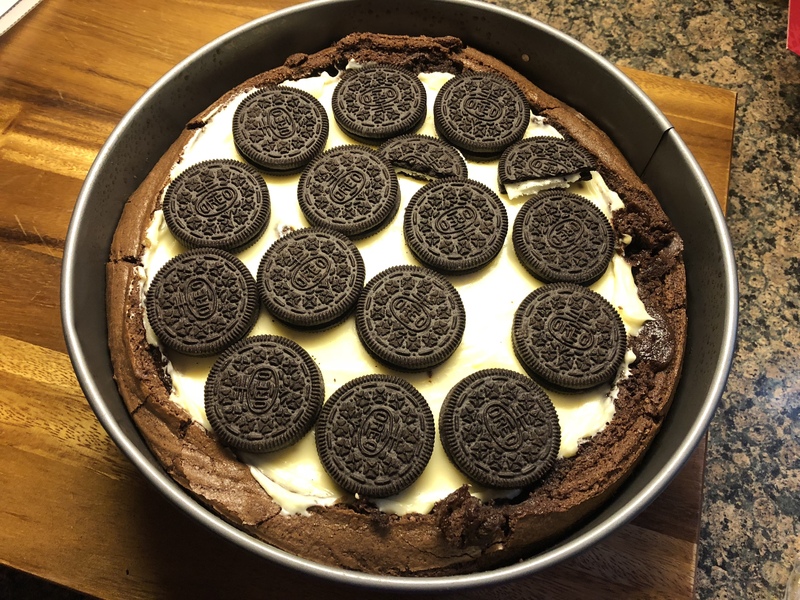 After the 30 minutes, remove the brownie from the refrigerator and line the bottom with a single-layer of Oreos. 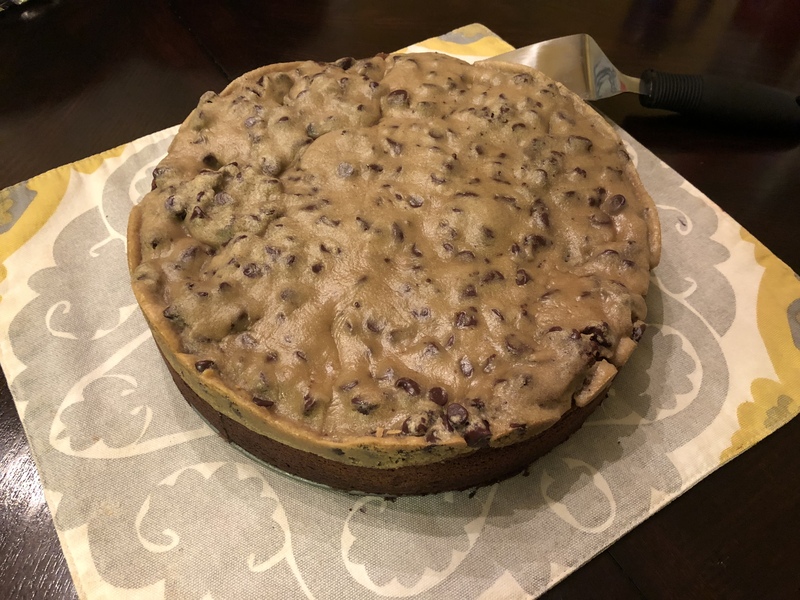 Pour the cheesecake mixture over the cookies and bake in the oven for 35-40 minutes, until the cheesecake is set, but slightly jiggles in the center. Let cool for a few minutes and then place in the freezer for 30 minutes. 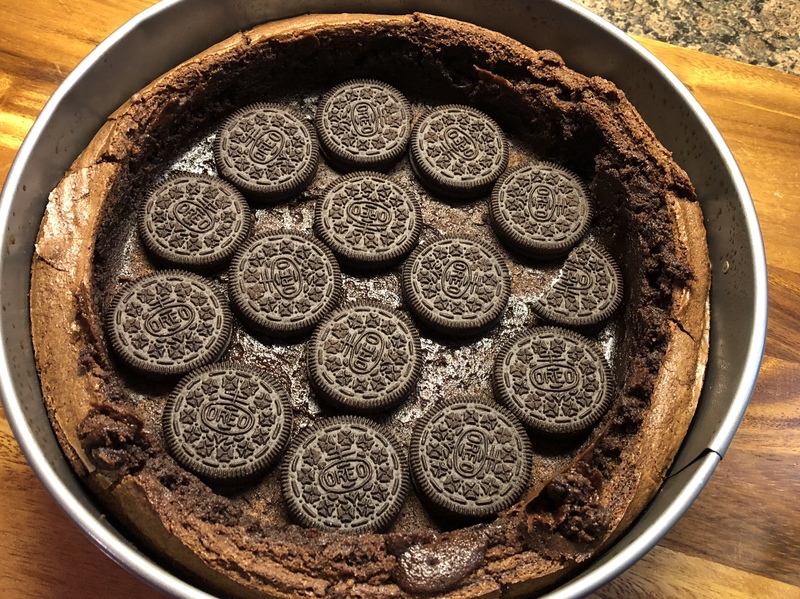 After these 30 minutes are up, place a single-layer of Oreos on top of the cheesecake layer and then place the frozen chocolate chip cookie dough disk on top. Tucking in any edges and bake for 20 minutes. Let it cool for a few minutes and then refrigerate for 2-3 hours before removing the ring and slicing. 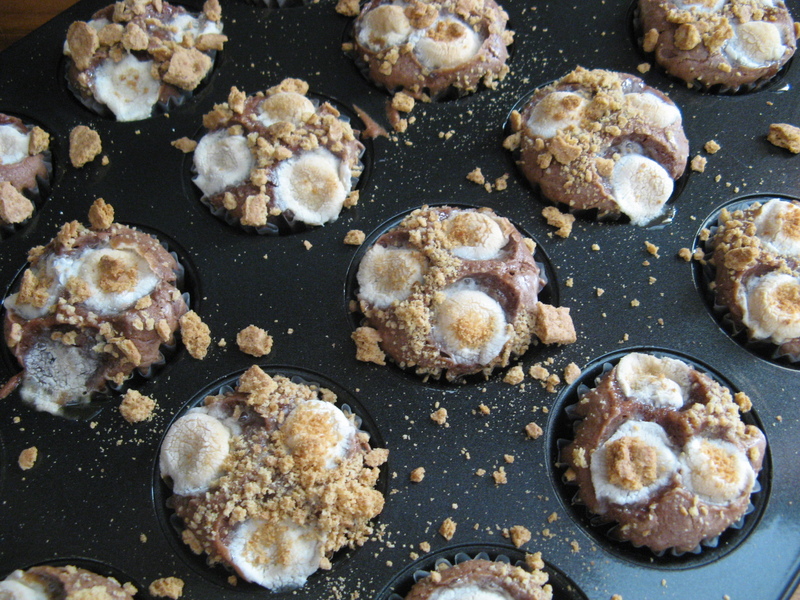 Serve with a dollop of whipped cream and an Oreo on top. **A quick tip… Instead of placing the Oreos in a single-layer, crush them. It would definitely make slicing the cake easier and less likely to fall apart. If you’ve been perusing decorated cakes on Instagram or Pinterest lately you may have noticed an influx of cakes decorated with some fancy and elaborate looking flowers. You may have thought to yourself that they require some advanced skill in cake decorating to create, but, the truth is, they only require specific types of decorating tips, a little patience and the right frosting consistency to replicate. 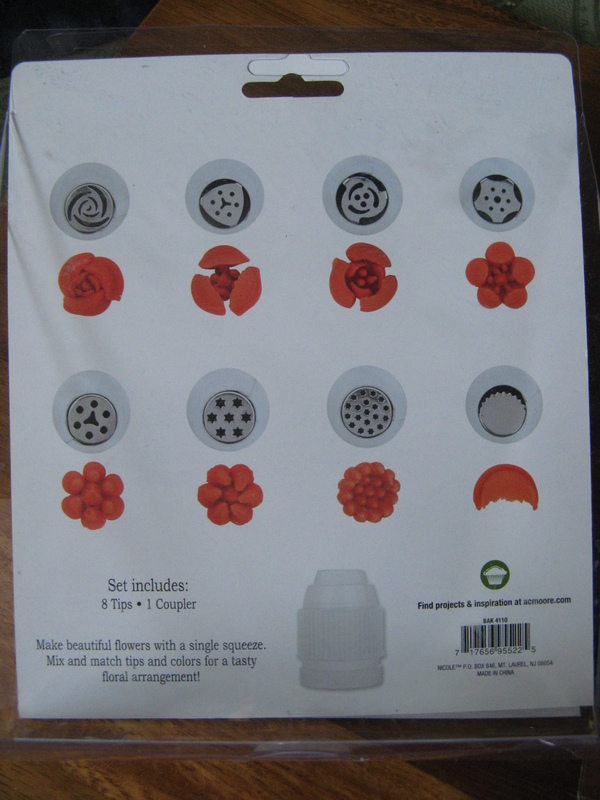 When I first started seeing them I did a little research and discovered that the flowers were being created with decorating tips known as “Russian Decorating Tips.” After a little more research I discovered that these tips have nothing to do with Russia. So, how did they get their name? Per another blogger, I Am Baker, they got their name because they were being sold by a company called Ali Express and they named them “Russian Tips.” At the time I didn’t feel like ordering a set over the internet, but, not too long ago I discovered that my local AC Moore began selling a set of 8 (along with an extra-large coupler to use with them) for less than $10. Truth be told, you don’t need the coupler. You can just cut your decorator bag and drop the tip in. I would suggest using a 16-inch decorator bag with these tips as opposed to a 12-inch one. Unlike traditional decorating tips from Wilton & Ateco, these tips do not have numbers on them. 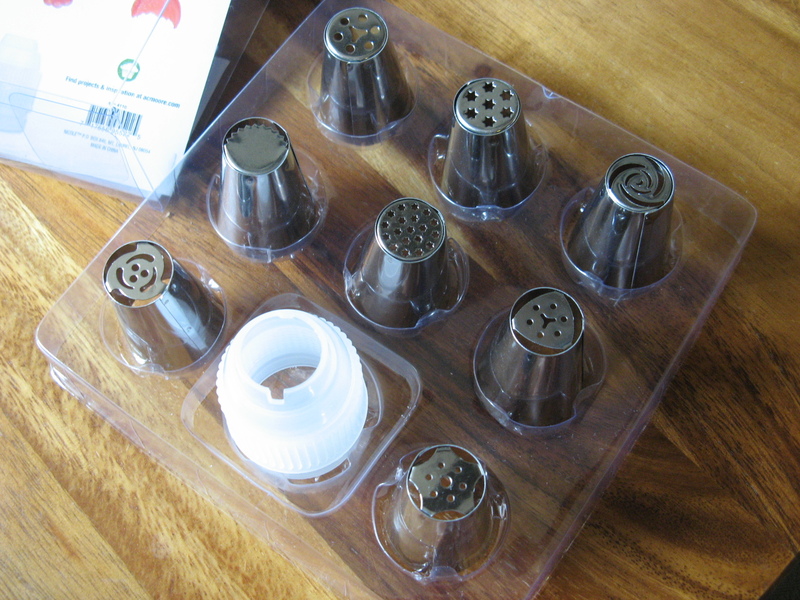 The tips have a laser cut design on the end that allows the frosting to be piped through and form the different flowers. I will say that some of the tips are easier to use than others. Some of the designs, especially those that have detailed centers meant to emulate the stamen & stigma part of the flower, take a little more practice to master. One other thing that is different is the way you pipe them. With your usual tips you sometimes have to add a little wrist twist to get the flower design, or, you have to hold the bag at a 45 degree angle. But, with these tips you hold the bag at a 90 degree angle about an inch or so from your cake (or cupcake) and squeeze for a few seconds to form the flower. Before piping the next flower I would suggest wiping the tip clean to get a nice flower for the next pipe. Like I mentioned earlier I purchased a set of these tips from my local AC Moore store. I can’t remember how I knew they carried them; I probably saw something on their Instagram feed. I decided to hold off on using them until I made my Mother’s Day cake. I did test them out using store bought vanilla frosting and as I had suspected and had read a little bit about, the frosting was too thin to get a well-formed flower. 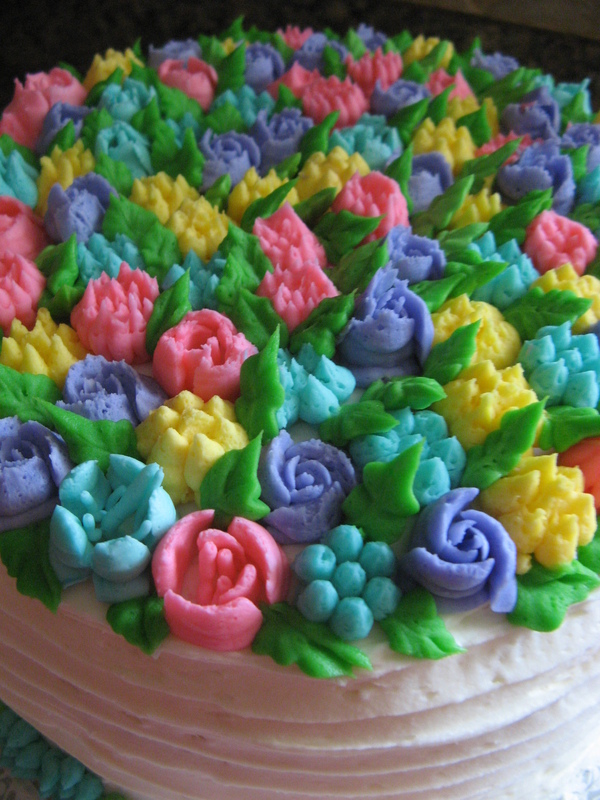 All of my test flowers looked like little blobs of frosting as opposed to a flower. So, using my go-to Fluffy Vanilla Frosting that I then tinted in 4 different colors I began decorating the top of my cake. I was soon a bit frustrated with some of the tips. 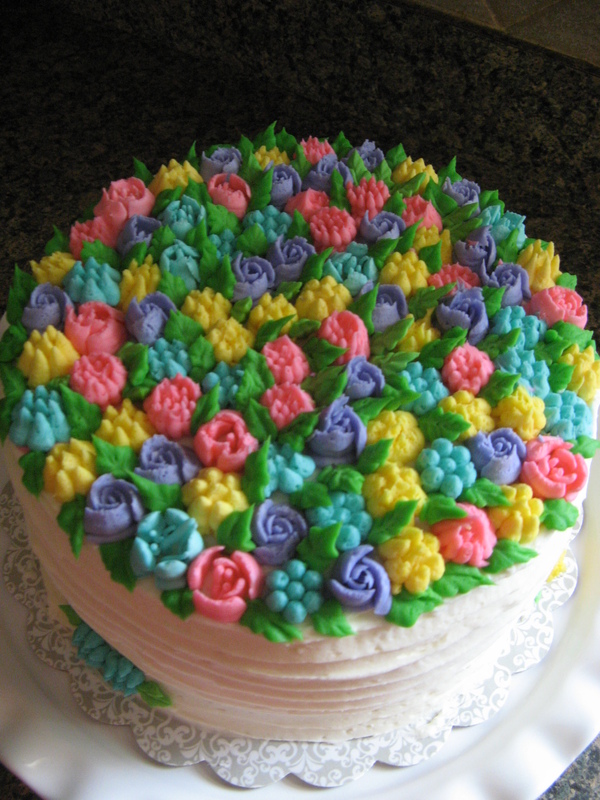 The flowers weren’t piping well and even though the frosting was a stiffer consistency the centers of the flowers weren’t looking nice. So, I decided to switch the tips I had chosen to use. 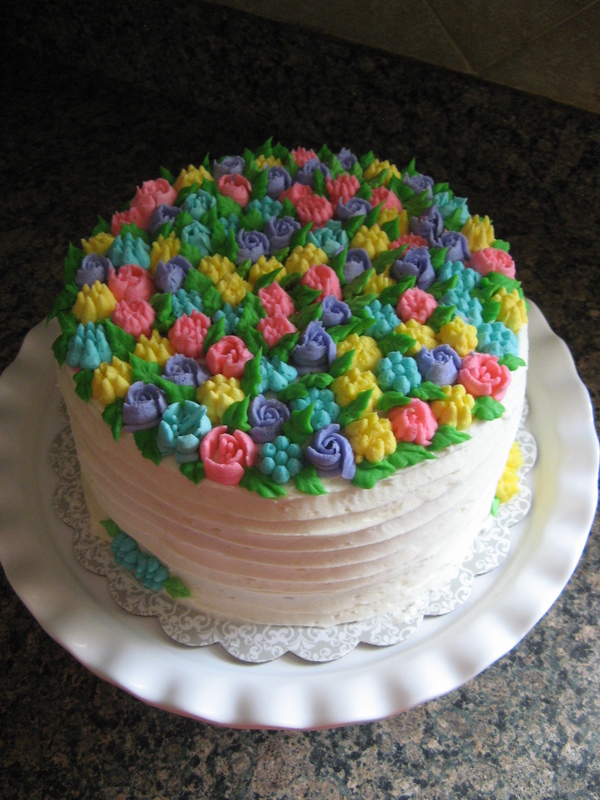 Soon enough I got the hang of it and ended up with a flower topped cake I was content with. It wasn’t until I added in leaves (using a Wilton 352 tip) that I piped around the cake and in between the flowers to fill in the gaps that I was truly happy with the outcome. I hope you all had a wonderful Thanksgiving weekend filled with love and laughter amongst family and friends and of course some delicious food! 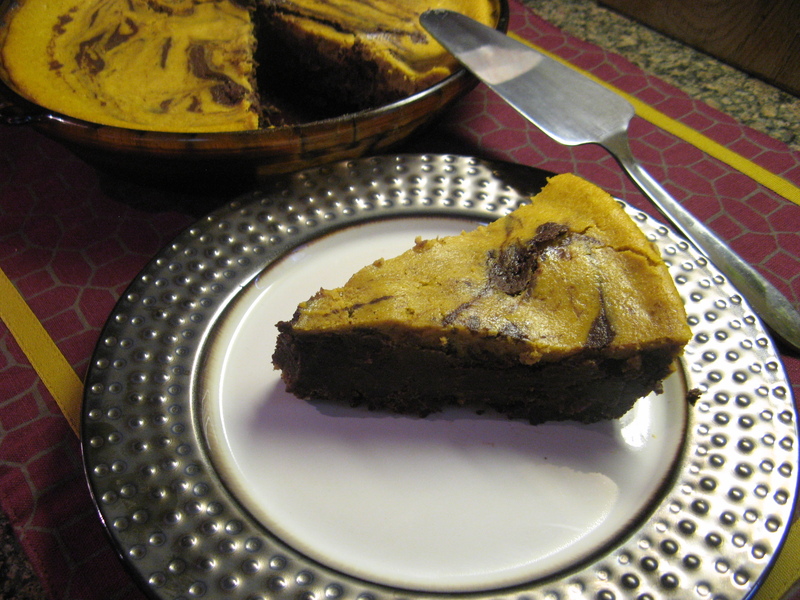 My Thanksgiving was good and while there was plenty of scrumptious food to be had there was also plenty of yummy desserts… Including this Pumpkin-Brownie Swirl Pie. 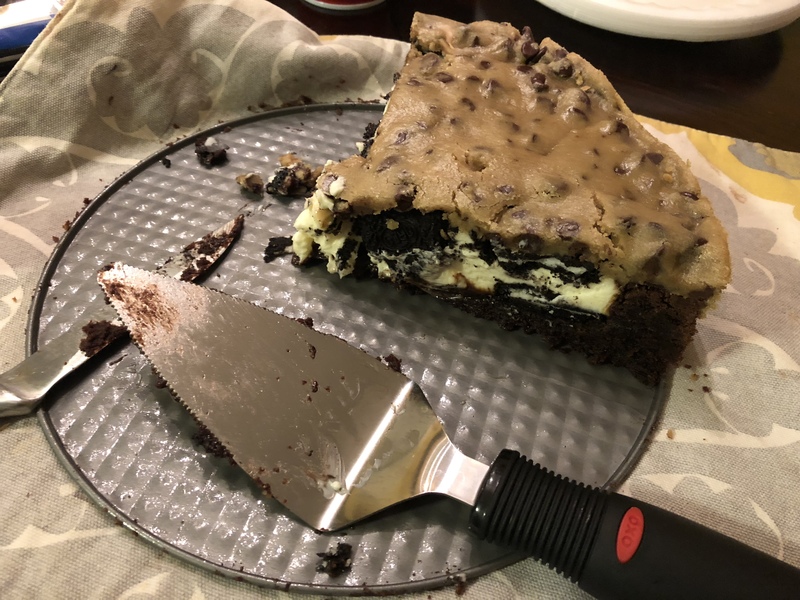 To begin, I made the brownie batter portion of the pie by melting a stick of unsalted butter and a 12-ounce bag of semi-sweet chocolate chips along with light brown sugar over medium heat in a saucepan. Once the butter and chocolate were melted I removed the saucepan from the heat and whisked in two eggs and vanilla extract. In a medium bowl I whisked together flour, cocoa powder, baking powder and salt and then added this flour mixture to the chocolate mixture and whisked it until the both were combined and smooth. 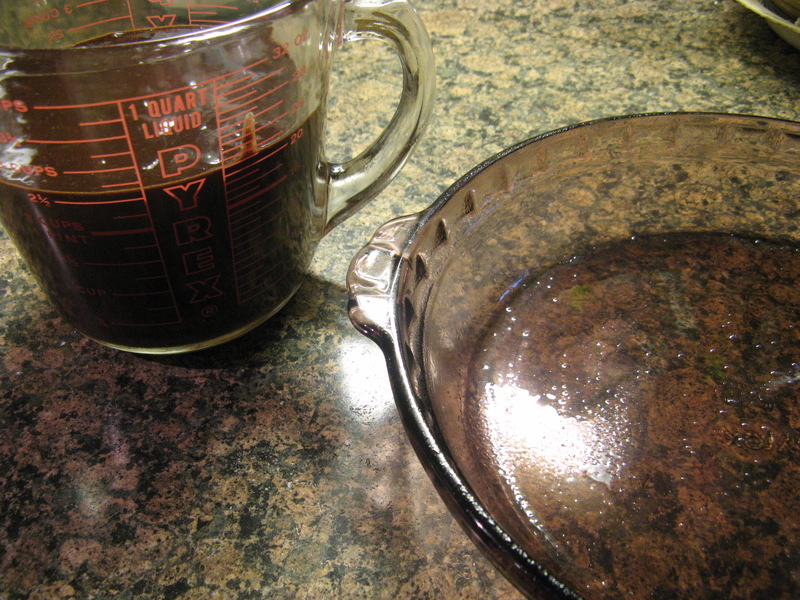 Following that I transferred the brownie batter into a measuring cup to ensure that I would pour the right amount – a third of the batter – into the prepared pie plate. While the brownie was baking in the oven I made the pumpkin filling by whisking together pumpkin puree, heavy cream, an egg, granulated sugar, flour, pumpkin pie spice and salt in a medium bowl until it was smooth. By the time I was done with the pumpkin filling the brownie was ready to come out of the oven. I immediately poured the pumpkin filling over the brownie. I stirred a tablespoon of water to the remaining brownie batter and then spooned the batter onto the pumpkin filling. Using the back of the spoon I then pulled the batter into the filling. 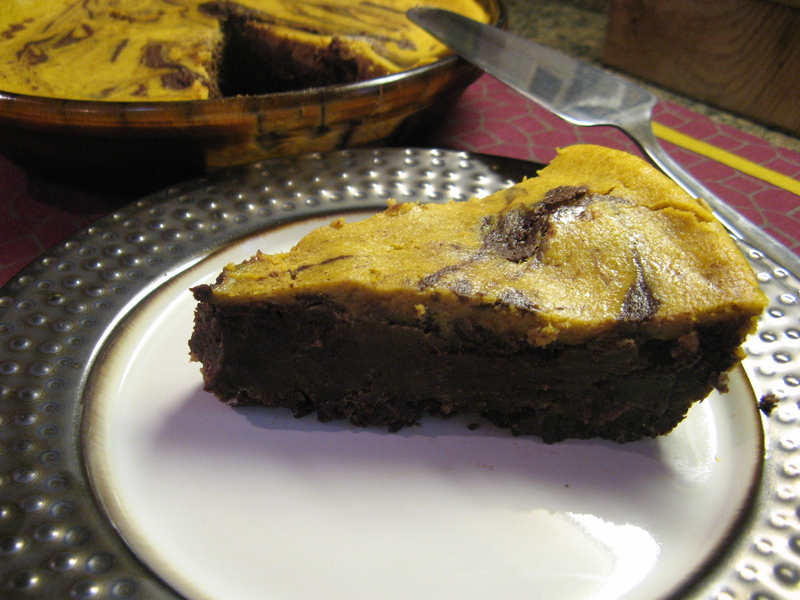 After baking for about 40 minutes in a 350 F preheated oven the Pumpkin-Brownie Swirl Pie was ready to come out. Unfortunately it did end up cracking a bit but luckily it didn’t affect the flavor one bit! Pumpkin and chocolate is definitely a winning combination! 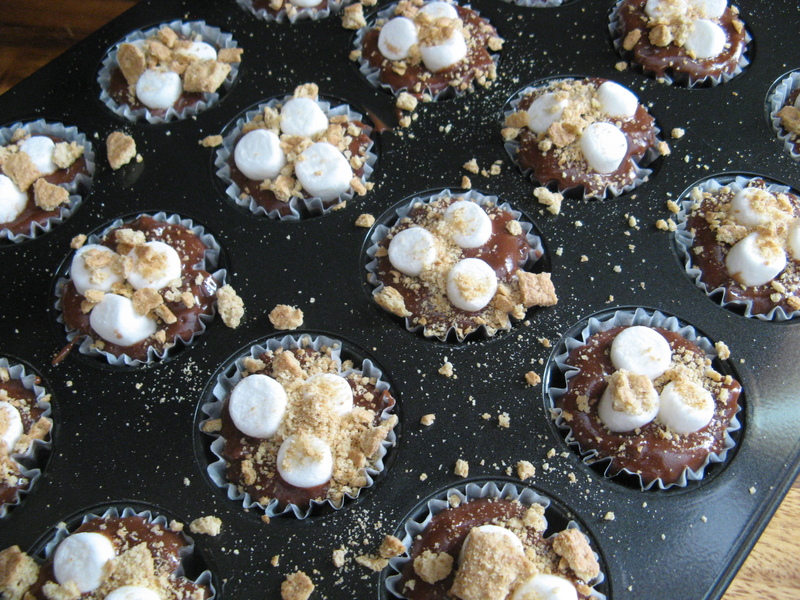 The sweetness of the brownie is such a nice complement to the mellow taste of pumpkin spiced with pumpkin pie spice (a combination of cinnamon, ginger, nutmeg & allspice.) I took half of this pie to a friend’s house for dessert and one of the guests commented that I needed to go home and get the other half. You can’t beat a complement like that! 1. Preheat the oven to 350 F. Butter the bottom and side of a 9 1/2 – inch deep-dish pie plate. Make the brownie filling; Heat the butter, chocolate chips and brown sugar in a medium saucepan over medium heat, whisking occasionally, until the butter and chocolate are melted. Remove from the heat. Whisk in the eggs, one at a time, then the vanilla, whisking until smooth. 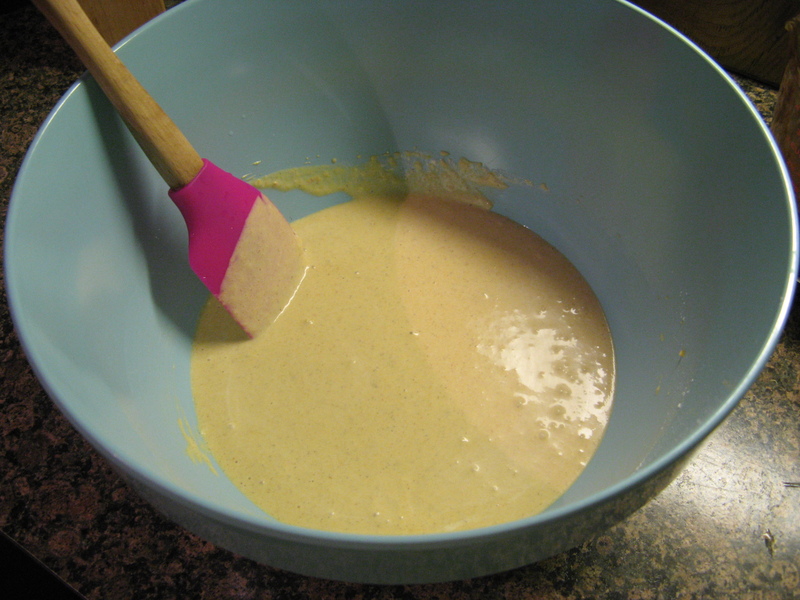 Whisk in the flour, cocoa powder, baking powder and salt until combined. 2. 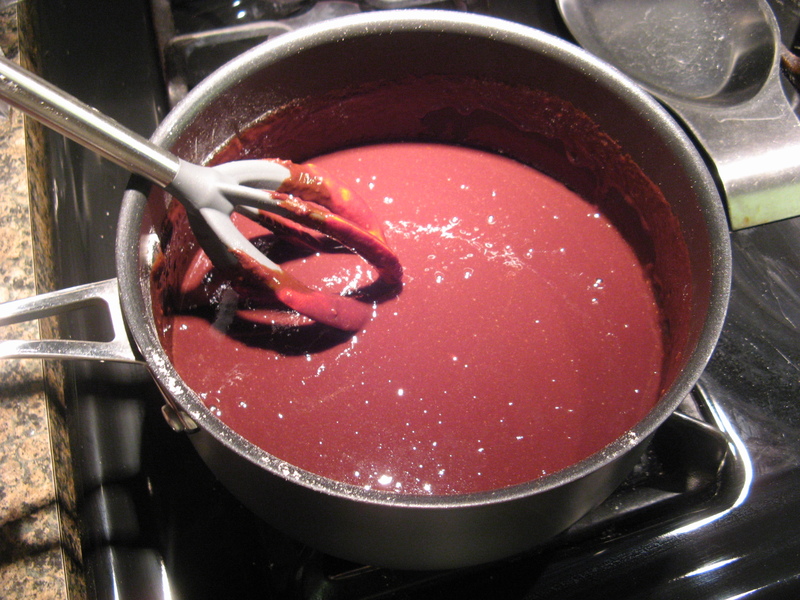 Pour about one-third of the brownie batter into the prepared pie plate; set aside the remaining batter. Bake until just starting to set and the top is shiny, about 20 minutes. 3. Meanwhile, make the pumpkin filling: Combine the pumpkin puree, heavy cream, egg, granulated sugar, flour, pumpkin pie spice and salt in a medium bowl; whisk until smooth. 4. Pour the pumpkin filling over the warm brownie layer. Stir 1 tablespoon water into the remaining brownie batter, then spoon the batter (in about 6 scoops) onto the pumpkin filling. 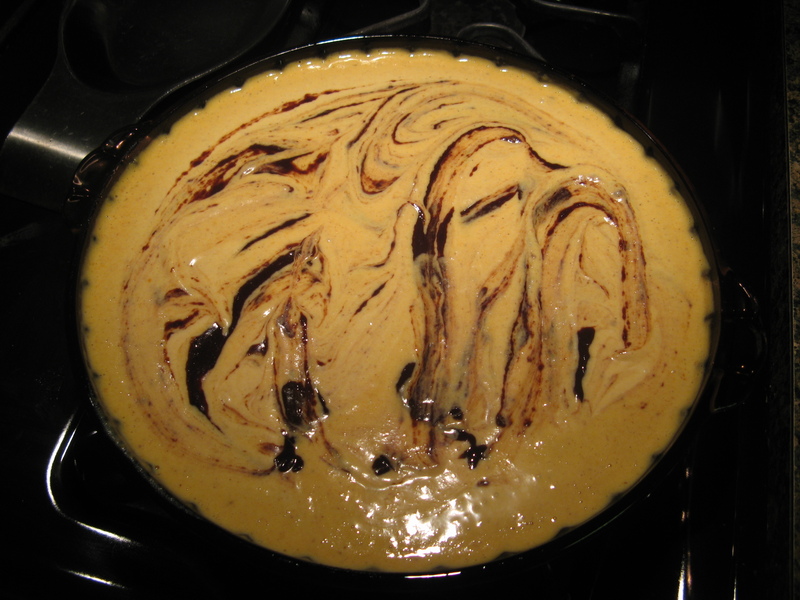 Use the back of the spoon to pull the brownie batter into the pumpkin filling and create a swirled pattern. Bake until the pie is set, 40 to 45 minutes. Transfer to a rack and let cool completely.